Emily of la dolce vita is hosting In the Pink; raising Breast Cancer Awareness among food bloggers. Well, we're good-hearted people...why not? Having found out about this completely last-minute, I came up with a quick and easy solution: caramels dipped in melted white candy melts, tinted pink! Cute, and sooo sweet and vanilla-y. Wow - looking at the photo quickly, it looks like marshmallows suspended in a jelly. Very effective!! hmm... pink.... red colouring with white chocolate ? Looks like what Niki said " marshmallows "
Actually, blame the camera. No matter what I did, what angle I took the picture...it came out slightly shadowed and redder than actual! The caramels are truly dipped in pink-tinted white, meltable candy...and displayed on Waterford crystal! What a simple-yet-smart idea. 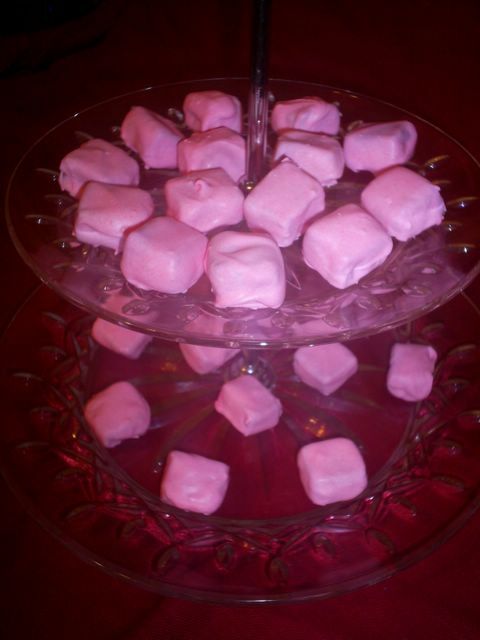 Your caramels look so pretty - like cute pink clouds! I also love the way you have them displayed...they do look like they're floating! Thanks, Emily! I'm just happy I could participate. These are so nice! They looks just like the pink candies Marshal Field's is selling for Breast Cancer month! Theirs are mints. I like the idea of caramels much better! Thank you so much...they were insanely simple to make.